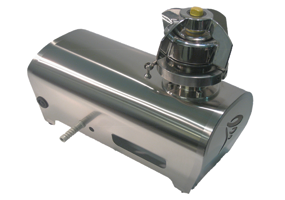 The Kest-Mixer is a magnetic coupled vessel mixer for aseptic applications & is designed for SIP/CIP applications. Latest technology is used to fulfill demands from Pharmaceutical industry, both in respect of material and design. The Kest Vessel Mixers are available in a variety of sizes from mixing volumes of 0.2 litres, to the larger sizes of mixers up to mixing volumes of 35,000 litres. The tank plate is to be welded into the mixing tank, and easy operator handling of the drive unit is secured by the Kest-Lock connection, between the drive unit and tank plate, on the smaller sizes KM-3/7, KM-7/20, and KM-20/70. Drive unit to be controlled by frequency converter with appropriate ramping parameters in relation to the specific application.